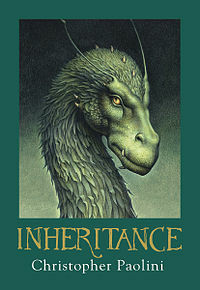 I re-read Eragon, Eldest and Brisingr so I could read “fresh” the fourth and final installment “Inheritance”. It is a good series. The ones I liked the most were Eragon and Inheritance. Although I understand the middle two were needed to build the world Paolini envisioned, I felt it was almost too much. For whatever reason, we were made to wait such a long time for the fourth novel. That forced me to re-read to remember the whole storyline. That frustrated me a bit. The characters were good and solid. If you love everything Dragon, Elven, Dwarvish, and Magical – then I suggest you read this series. It was good, although longish. If you read, let me know what you think.